Next week I’m going to a two-day professional meeting, a chance for all my peers to get together and compare notes, discuss burning questions in our field, network and arrange collaborations for the coming year, and so forth. I’m getting a bit weary of this model of conference organisation: packing as many unrelated one-way infodumps into the day as possible so everybody can get credit from their institution for presenting. In most cases they’re not sharing any actual new research or findings, it’s just a status update. Despite most of the presenters being curators of visual arts, I predict there will be lots of bullet-pointed text. Six-minutes-forty-seconds pechakucha talks would be one way to keep people to time. And you actually have to rehearse for a pechakucha, which would be a nice change. Yes, it’s a bit more stressful, but (horrible statement coming up) people who don’t feel confident enough to give a pechakucha shouldn’t be giving public talks, or rather should be sharing their ideas in some other way. An unconference with no scheduled talks and spontaneously-assembled sessions would be a better alternative for this small group. Everyone says what they want to share, the schedule is put together with Post-It notes or on a Google-doc spreadsheet, and people gravitate to what interests them. Everybody participates. Having a particular goal: in my area, it might be thrashing out a joint statement on the trade in moa bones, collectively developed from discussions as a Google document, with everybody signing their names at the end. For others, it might be developing the initial concept for an app, or brainstorming an object list for a collaborative exhibition, or adding to a tips/trick list for Vernon, our database software. The idea is to produce something tangible at the end. Panel discussions that are actual discussions, where people argue with each other, rather than deliver mini-lectures in parallel. The chairperson should be actively stopping people, inviting contributions from the audience (comments, votes, thrown objects), intervening with questions of their own, and grilling panel members. Even the conventions of a formal debate would be an improvement: yes/no to a stated proposition, time allocated for rebuttal. Half the conference time—no less—devoted to networking, with empty rooms and projectors available for meetings and spontaneous workshops. Adventurous use of Twitter: questions taken from the projected twitterstream, sessions formed in response to questions using the hashtag, Twitter handles first and largest on conference badges. No conference pack stuffed with junky fliers and jellybeans, no comb-bound conference book. The programme should be a dynamic website, viewable on a mobile device (and loaner tablets should be available for people without sufficiently-smart phones). Sketchnoting for every session, by volunteers or even a professional, collected together as a PDF and sent to all the attendees as a memento. 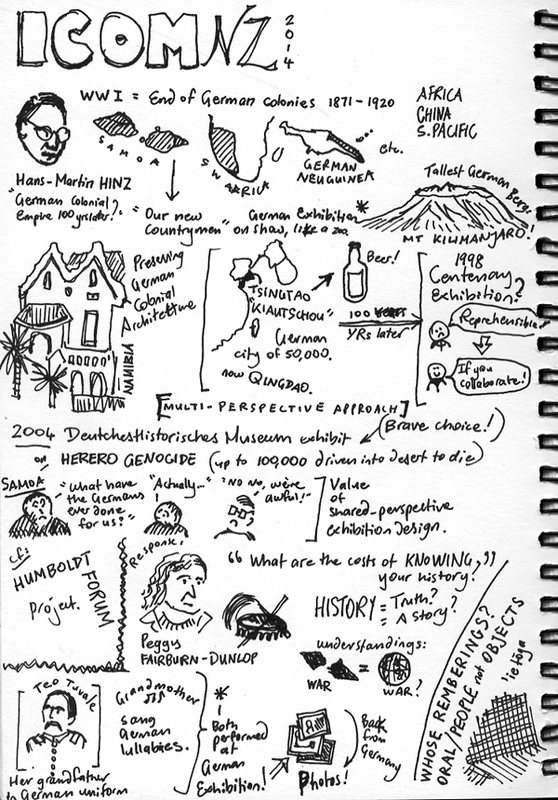 My sketchnotes from Hans-Matin Hinz’s talk at ICOM in Auckland. These ideas wouldn’t solve all the problems of the traditional conference format, but in a small meeting, where collaboration is more important than formal presentations, they’d make for a more valuable use of everybody’s time. This entry was posted in Musty-Dustiness on 11 Nov 2014 by Mike. I’m with you on this – I thought a lot about ite at a recent industry conference – but there are a couple of things that need to be stressed. A badly run unconference with non-participating attendees is a Hell On Earth. Traditional conferences can be much wider in scope and numbers, so there is the opportunity for ‘happy accident’ – which is not to be dismissed. We have all been to boring events. The crime is repeating the events with a business as usual attitude. Enough with the notion that people get credit for presenting or attending. Bums on seats is not a measure of an engaging event. Personally, I don’t know how we change the status quo. Participants and speakers could insist that events push the boundaries for participation, transparency and legacy. I would love events that promised a blended learning environment of face-to-face interaction and digital engagement. What if speakers agreed to participate in public Google hangouts before and after the event? What if participants were given the event Twitter hashtag during registration? What if remote participants could be called on to create real-time transcripts of the proceedings and encouraged to ask questions which would be fielded by those at the physical event? When events fail to meet expectations, what are our options? We would like ways to suggest improvements to event organizers. Do events collect feedback from participants? If the event has local impact, do locals have a way of indicating what worked and what did not? If the event has regional or international impact, are there ways to collect feedback from the larger public? And in each of these cases, to what degree is the feedback received in an open and transparent manner? Excellent post ! I’ve been thinking about these sorts of things for a few years.